Republican Gov. 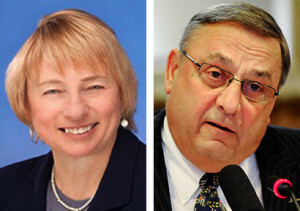 Paul LePage said during a radio interview Tuesday morning that he would consider running against Janet Mills, the Democratic governor-elect, in four years if she fails to implement voter-approved Medicaid expansion in a financially “sustainable” way. LePage said that would mean Mills would not touch the state’s budget stabilization – or rainy day – fund to pay for expansion of MaineCare, as the federal-state program is called in Maine. Expansion would provide health insurance to about 70,000 low-income Mainers. A better way, the governor suggested, would be for Maine to increase taxes on hospitals, an idea he floated earlier this year. The governor said it would be unwise for Mills to raid the state’s rainy day fund to finance MaineCare expansion, which he estimates would cost about $200 million to implement in the first year. According to LePage, there is about $276 million in the fund. The governor did not explain the reference to where the state was in 2010..
Mills’ spokesman, Scott Ogden, responded to LePage’s remarks in a statement Tuesday night. LePage said that he and his wife, Ann, have just started discussing buying a home in Maine where they would summer. They already own a home in Florida. LePage vowed to keep an eye on the state’s finances no matter where he is living. Last week, just before the Nov. 6 election, the governor told reporters in Augusta that he was planning to move to Florida for tax reasons and would teach at a university. But on Tuesday, LePage told the Bangor radio station he would live in Florida during the winter months and spend his summers in Maine. “The only issue now is: Do we become residents of Florida or Maine?” LePage said. It was just last month in an interview with C-SPAN’s “50 Capitals Tour” series that LePage told host Peter Slen that he was done with politics and planned to spend more time with his wife and family. During the 14-minute interview Tuesday, LePage touched on a broad range of issues. He noted that he lost 80 pounds after undergoing bariatric surgery in the fall of 2016 and talked about his dislike of ranked-choice voting. He prefers runoff elections, which he described as the smartest, quickest and simplest way to get to 50 percent. LePage, who has less then two months left in office, spoke briefly about Democrats achieving a majority in the Maine House and Senate. The Democrats’ victories mark the first time in eight years that one party has gained control of the Legislature and the governorship. When asked why Maine Republican candidates lost in the Nov. 6 election, LePage said he did not have an explanation, but he also did not accept responsibility.